The Fire Brigades Union (FBU) has announced that its members in England and Wales will take strike action again this weekend, Friday 13 and Saturday 14 December, both from 18:00 to 22:00. These will be the fifth and sixth strikes since the end of September. 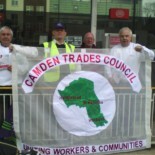 This entry was posted on December 5, 2013 by CAMDEN TRADES COUNCIL.